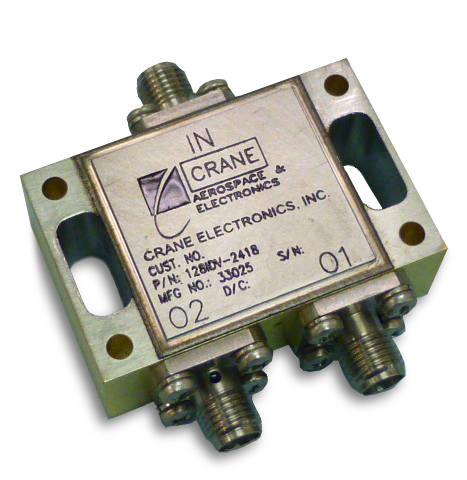 Crane Aerospace & Electronics, Microwave Solutions, specializes in the design and manufacture of high performance millimeter wave, microwave, RF and IF components, subsystems and systems for Government, Industrial and Military end-use customers. Crane Aerospace & Electronics is a major supplier of Systems and Components for critical Aerospace and Defense applications. They are designed for some of the toughest environments – from Engines to Landing Gear; Satellites to Medical Implants; & Missiles to Unmanned Aerial Systems (UAS). 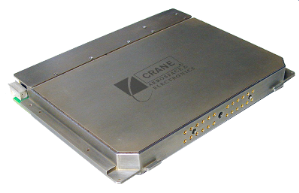 From application engineering, through design and manufacturing, Crane Aerospace & Electronics offers a comprehensive approach to product specification, design certification and service. Innovative process for microwave, multilayer integrated circuits and micro-multifunction modules (MMFM®) using a fusion bonding process. UHF to MM wave modules. Including advanced frequency synthesizers, Digitally Tined Oscillators (DTOs), Phase Locked Oscillators (PLOs), Multiple Output master oscillators. Frequencies from 50 MHz to 20 GHz. Voltage Controlled Oscillators, Crystal, Dielectric and Coaxial Resonator Oscillators. Frequencies from 50 MHz to 26 GHz. Soft-board and ceramic substrates and topologies (microstrip, stripline, suspended substrate). High performance and low cost. Isolators and circulators, miniature, broadband drop-in units, low to high power. Double balanced and triple balanced mixers with RF/LO. Frequencies from 0.5 MHz to 26.5 GHz. Power dividers, directional couplers, hybrids, modulators, phase shifters and other control devices. Detectors, limiters and comb generators offering broad frequency ranges and small packages. Log Amps and Detector Log Video Amplifiers (DLVA). Small packages, multi-octave bandwidths, fast rise and fall times and advanced CW Immune capabilities. Developed to specific customer requirements for use in phased array systems. UHF to MM wave. This unit combines the functions of high performance power dividers with ferrite isolators to provide a high isolation power divider solution, making the external isolators redundant, for satellite receiver applications, without introducing complex switch-based solutions. Integration of the two functions into a single package provides enhanced product reliability due to fewer external components, interconnects and transitions. Additionally, marrying the power divider and isolators in the same package allows the performance of the integrated unit to be carefully matched and better overall performance can be obtained. The Iso-Divider product provides a satellite builder an integrated solution for redundancy protection in transmit and receive paths. A single, miniature device combining four individual units into a single housing. Provides enhanced reliability, lighter weight and better overall performance. Since the individual parts of the device are controlled by Crane, their performance can be carefully matched together to assure the best overall unit performance. The VPX line includes three products: Modular Quad IF Up and Down Converter, Modular Direct Synthesizer, and the Modular Seven Channel Indirect Synthesizer. Provide critical functionality for processing of rapidly evolving Electronic Warfare signals. Low spurious and noise performance, as well as an exceptionally small physical implementation provides a platform on which to build future advanced system architectures. The modular VPX configuration allows common modules to be re-used readily in new applications. VITA 48.2 package and backplane configuration. This Master Oscillator is designed to provide all of the signals required for an advanced system. Starting from a low noise, vibration insensitive Crystal oscillator, all of the subsequent signal outputs are derived. The unit is designed to offer very low spurious signal output and excellent signal stability over the operating conditions. An advanced Built-in test function provides indication, through the VME bus, of the signal output presence for each output. Also provided is the ability to disable each output from the command bus. 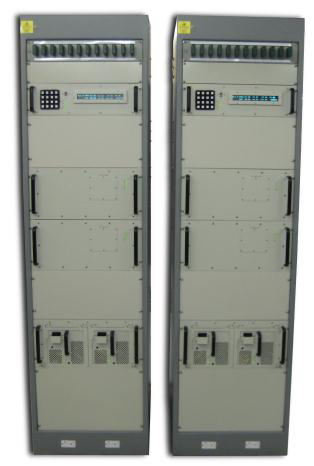 The 1 – 2 GHz Switch Matrix system is designed to be utilized in a satellite communications ground station application. This system sits between the up/down converters and the system modems in order to route the signals to their required paths. The system is designed to be expandable from a base configuration of 12 converters by 48 modems to a maximum configuration of 24 converters to 192 modems. This architecture can be used in a wide variety of installation sizes. Signal fidelity in the unit performance is critical, and this unit responds with exceptional isolation and intercept signal performance. This very high signal fidelity allows for many signals to be routed through matrix simultaneously, while not degrading the quality of the other signals being routed. This system can be custom configured for the customer’s individual needs.